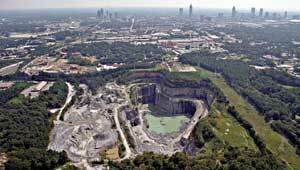 In 2006 the City of Atlanta purchased a quarry in northwest Atlanta that had been in operation for more than 100 years. In December of that year TPL preserved a 10-acre property located at the quarry entrance as an addition to the site. The entire property will be converted into a new 300-acre park along Atlanta's Beltline, a 22-mile corridor of parks, trails, and transit encircling downtown. The new park will be the largest in the city and the quarry itself will become a sparkling 1.9-billion-gallon water reservoir.